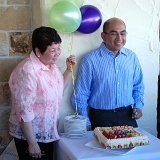 Cosme Purugganan is a legend in the Filipino community, and with his wife Evelyn, was an enormous help to Linda when she first moved to Australia. She has kept close ties with them for 20 years now. When Gaby and Sabine come home from school they often play in the front yard. Linda arrived on 24th August, and once she had secured accommodation and bought all the necessities like white-goods and beds, the girls followed just two weeks later.